Remember when I often gave “bad” movies a chance on this blog? I found this movie and had to give it a try. I’ll probably regret it, but hopefully my readership (all four of you) will enjoy it. 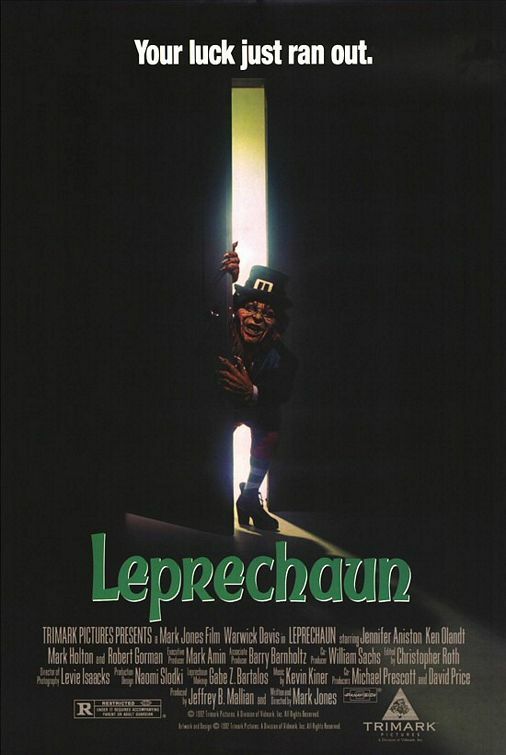 If I recall correctly, the thing this movie is most infamous for is making Leprechaun 2 possible, so at least I know I haven’t signed up for the worst horror movie of all time. Three reasons I’m reviewing this now: It’s not quite Halloween, so this isn’t a holiday tie-in; it’s nowhere near St. Patrick’s Day, so I don’t ruin my St. Patrick’s day (also St. Pat’s won’t be on a blogging day next year); and I found it while looking for a movie to do this week. Returning home from his Irish mother’s funeral, Mr. O’Grady reveals to his wife that he’s come into money. Leprechaun money. Unfortunately, the leprechaun has followed him home to reclaim it, but O’Grady seals it in a crate with a four-leaf clover. Ten years later, L.A. girl Tory and her father move into the abandoned O’Grady house, and the young local painters accidentally let it out, allowing it to slaughter anyone who stands between him and his stolen gold. It’s hard to place this film. It’s trying to be a horror, and the gore is certainly worthy of its R rating, only there are so few gory scenes I’d be tempted to knock it down to PG-13 but for the swearing. There’s so much kiddish comedy in it (at one point the leprechaun crashes into a fence leaving a leprechaun-shaped silhouette) that it often feels like an attempt at a children’s horror film, but again, rating, gore, language… the early “Tory and the boys” scenes feel more like The Goonies than anything (sometime I should see that from beginning to end). This movie’s been criticized for emphasizing in the rereleases that it stars Jennifer Aniston from just before Friends, but I think it’s of some interest to see her not just acting against type, but before she had a type. On the other hand, she’s so deep in the “Teen” look, I can barely recognize her. Maybe it’s because I’m not interested in the right kind of movies, but I’ve never seen the “Dutch Angle”, where the camera is tilted so that up is diagonal to give the scene tension, so abused as in a few of the later scenes. And that’s an effect I appreciate and wish I could use more often. However, the shots in question rotated the camera almost a full 45 degrees, which I hope should make it obvious even to the cinema layperson. When I noticed the music, it was interesting. Like Celtic without being Celtic. The makeup on the leprechaun was pretty good, I guess. Probably the second-lightest makeup I’ve ever seen on Warwick Davis. The effects were pretty effective for their time, though the leprechaun dis-invisibling/apparating was weird, because he seems to appear skeleton-first. This is a chaste story of a couple of young teens, a kid, and a simpleton getting comically chased by one of the most unassuming mythical creatures. It also features limited, horrific violence. This is what you show teens who have outgrown Scooby-Doo, I guess. Watch this movie: if you can handle lots of slapstick in your horror. Don’t watch this movie: if you can’t handle lots of gore in your comedy.